Fox’s Glee is set to return for one last run at midseason. 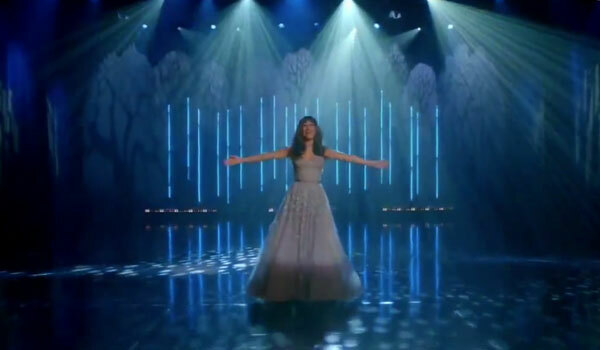 To celebrate the final year of high school and Glee Club-oriented antics the network has put together a new preview for the sixth and final season and it includes footage of Lea Michele singing “Let It Go” from Disney’s Frozen, because of course. Check it out, below. Glee has a special two-hour premiere planned for the start of Season 6, and it looks like that premiere will be bringing Kurt and Rachel back to McKinley High. The two dealt with plenty of tumult last year, with Kurt dealing with a homophobic attack, Rachel trying to salvage her reputation after quitting Funny Girl and everyone dealing with Finn’s death in different ways. Returning to McKinley High should be pretty weird, but in the video Kurt and Rachel make it clear they have one goal in mind—starting up the disbanded Glee Club and returning it to its former glory. Obviously, this includes stage lights, a glittery dress and big bold vocals from Lea Michele’s Rachel. The setup looks pretty great, but does anyone else think Glee is missing a prime opportunity for a duet, here? Idina Menzel, who actually plays Elsa and sings the original version of “Let it Go” in Frozen also happens to play New Directions rival and Rachel’s biological mother, Shelby, on Glee. The crossover possibilities are endless, although I feel the Frozen song probably would have been more fitting (in terms of popularity) if Glee had hit the schedule this fall instead of this winter. We’ve known for a while now that Season 6 will focus on the original people that starred in the show and that audiences initially fell in love with. Pulling Rachel and Kurt from the big city and bringing them back to their old stomping grounds should prove to be the easiest way to get the gang back together. That should give Season 6 a focus that the last couple of seasons have not had. Before we get there, the show will need to explain why Kurt might leave New York and what happened with Rachel’s big pilot, though. Season 6 is expected to be a shortened season. Only 13 episodes were ordered, giving Ryan Murphy and co. just enough time to capably wrap up the storyline. You can catch new episodes of Fox’s Glee starting on Friday, January 9 at 9 p.m. ET. Or check out the full midseason schedule, here.